Most people are familiar with an alarm device. The majority of us rely on them daily to get us up and moving to start our day. The evolution of this modern must have device is rather interesting. From mechanical to technological, alarms have been improved and shaped to match our every changing lives and keep us on top of our game. The basic design of a home alarm device is that it combines a clock with a timer. The device usually has some way to set it for the specific time when the alarm is to go off. There are usually buttons to set the alarm and then a button or lever to turn it off. In general, the device will keep time and when the set time is reached the alarm will sound an audible tone to alert you that it is the time for which you had the alarm to go off. 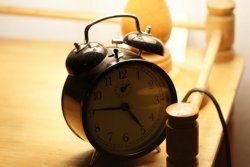 The origins of the modern alarm clock are traced back to China. Striking clocks which sounded upon the hour are considered to be the first type of clock with an alarm and they were first used by Chinese Buddhist monks. Such striking clocks were also found in the 14th century in Europe and could be set to chime at a given time. However, the first actual clock that resembled today's devices was created in 1558 and could be set to chime at any specific time by using a peg and wheel style operation. In the United States the first clock of this kind was created in 1787, but it was a device specifically made for the creator, Levi Hutchins, and would only sound at the time he had set, unable to be set for other times throughout the day. The traditional style is a mechanical device. It can be a simple design of a clock with an extra hand that is moved to the specific time for the alarm to sound. It can also be digital where the alarm time is set. The simplest design simply features the standard clock and then the alarm. Operation is usually rather simple and involved a few buttons to set the minute, hour and they turn on and off the alarm. An alarm clock can also be found on computers and cell phones. These are usually programs which come standard on the device or that can be downloaded. They are set much like a traditional alarm and will produce the alarm tone at the specified time. Waking up from a good sleep is not easy to do on your own. The invention of an alarm clock to wake you is a blessing for many. While these alarm devices may not be our favorite modern convenience, most people would agree they would be lost without it. The fact is that alarm clocks get us up and moving everyday so we aren't just lying in bed all day. Some would say it is a necessary evil. Ask Your Home Alarm Device and Home Alarm Questions HERE! !